Pierre Bourdieu was one of the most important thinkers of the twentieth century. He argued for, and practiced, rigorous and reflexive scholarship, interrogating the inequities and injustices of modern societies. Through a lifetime’s explication of the ways in which schooling both produces and reproduces the status quo, Bourdieu offered a powerful critique and method of analysis of the history of schooling, and of contemporary educational polices and trends. Though frequently used in educational research, Bourdieu’s work has had much less take up in Educational Leadership, Management and Administration. Educational Leadership and Pierre Bourdieu argues that ELMA scholars have much to gain by engaging more thoroughly with his work. The book explains each of the key terms in Bourdieu’s thinking tool kit, showing how the tripartite concepts of field, habitus and capitals offer a way through which to understand the interaction of structure and agency, and the limits on the freedom of an individual – in this case an educational leader – to act. 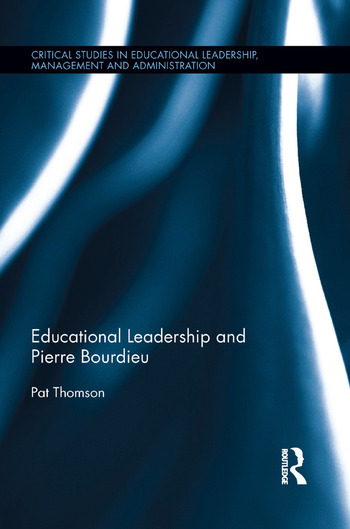 Educational Leadership and Pierre Bourdieu offers an analysis of dominant trends in ELMA research, examining the kinds of questions asked, projects undertaken and methods used. It provides alternative questions and methods based on a Bourdieusian approach, further readings and a range of exemplars of the application of these tools. The book will be of interest to those whose primary focus is the utility of Bourdieu’s social theory. Pat Thomson PSM, PhD, FAcSS is Professor of Education at the University of Nottingham, UK. She is a Visiting Professor at the University of the Free State, South Africa, Deakin University, Australia and The University of Iceland.